Running out of ideas for a Father’s Day gift? Does he enjoy jamming out? 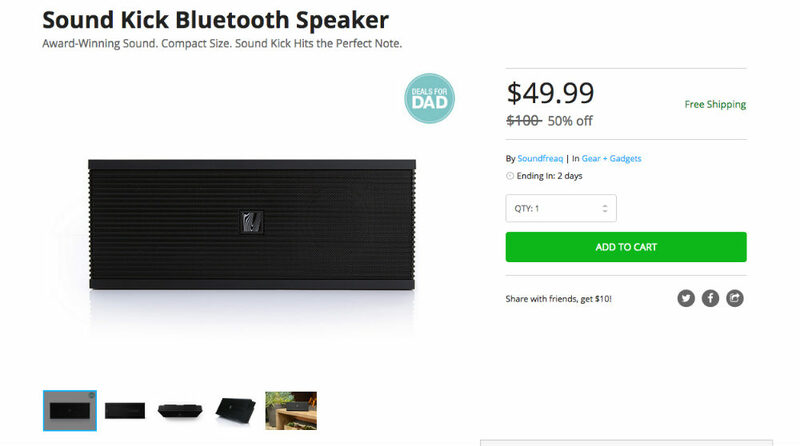 If so, you can pick up the Sound Kick Bluetooth Speaker on the DL Deals Store for just $50, down from its regular price of $100. To make sure your dad receives the gift on his very special day, guaranteed shipping within 1-2 business days is included, meaning you will definitely receive the item before Father’s Day (6/21). The Sound Kick features Bluetooth connectivity, allowing you to wirelessly enjoy your music for up to 7 hours before recharging is needed. Music playback and volume can be controlled directly from the speaker, or from the device you are streaming from. In addition to Bluetooth, you can also quickly connect any device with a 3.5mm headphone jack. You will also be happy to see that the Sound Kick speaker is rated very highly on Amazon, priced at just under $100. So for $50, this is a pretty good deal. If you think Daddy-O would enjoy this speaker, follow that link below. And remember, it comes with guaranteed delivery before Father’s Day, as long as you order before 12am tonight.